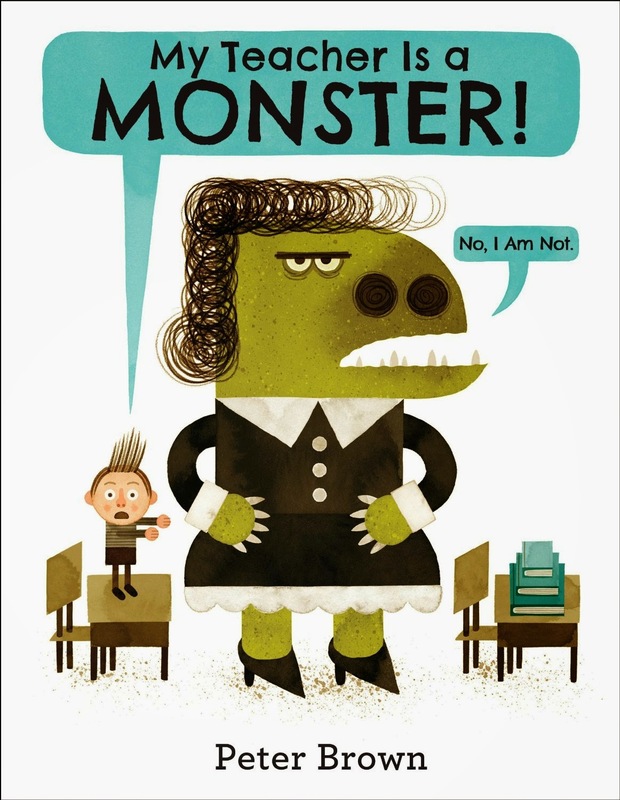 Literary Hoots: My Teacher is a Monster! Bobby is convinced his teacher is a monster. She yells at him, stomps around, and takes away his recess. But then one Saturday, as Bobby plays in his favorite park, he actually sees his monstrous teacher! Outside of school! Could this show Bobby that there's more to his teacher than meets the eye? Peter Brown's illustrations are my favorite. He always seems to take special care to fit it to the book (like Mr. Tiger Goes Wild , which is amazing) and to add some humor (like Children Make Terrible Pets , which is HILARIOUS). Did this book live up to that? Not in quite the same way, but it awesome in its own way. The subtle change for the teacher's illustration is fantastic. And little Bobby is pretty cute. Overall, it's a good tribute to teachers and those troublesome students. For students, it's a good reminder that teachers are people too!